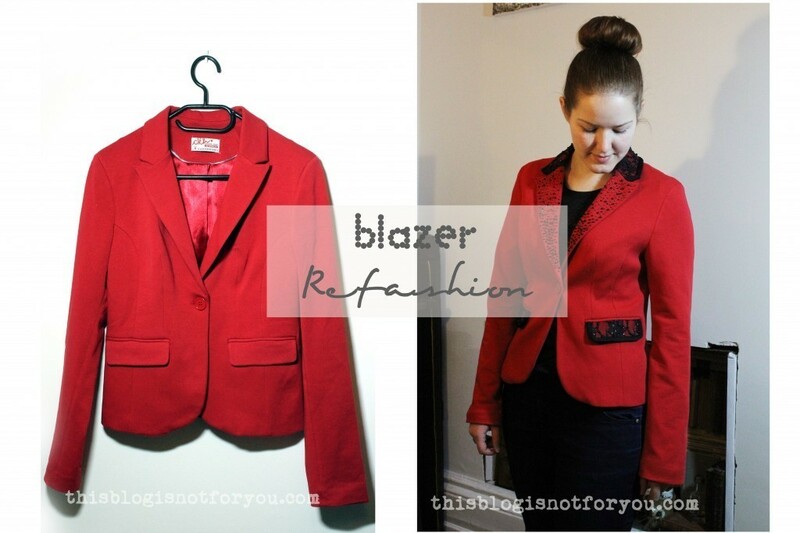 I love blazers. I love red. 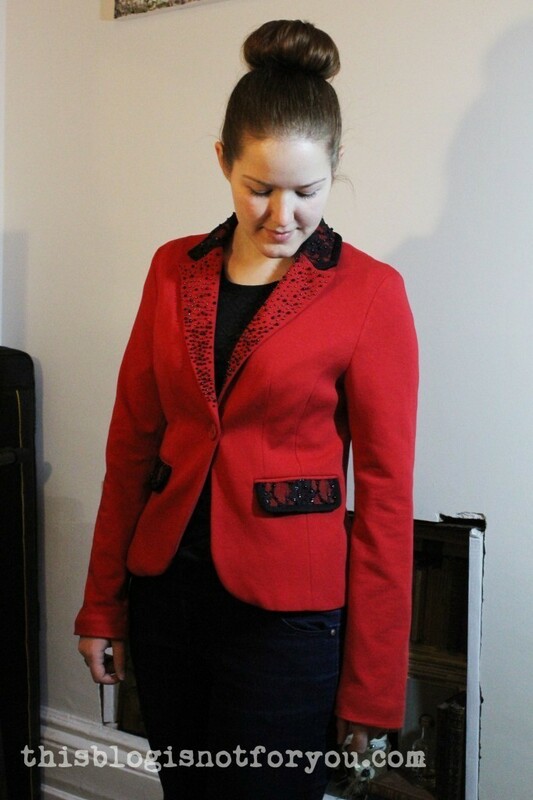 Bright red blazers can look really cool, but this one was a weird mixture of too bold and too boring. 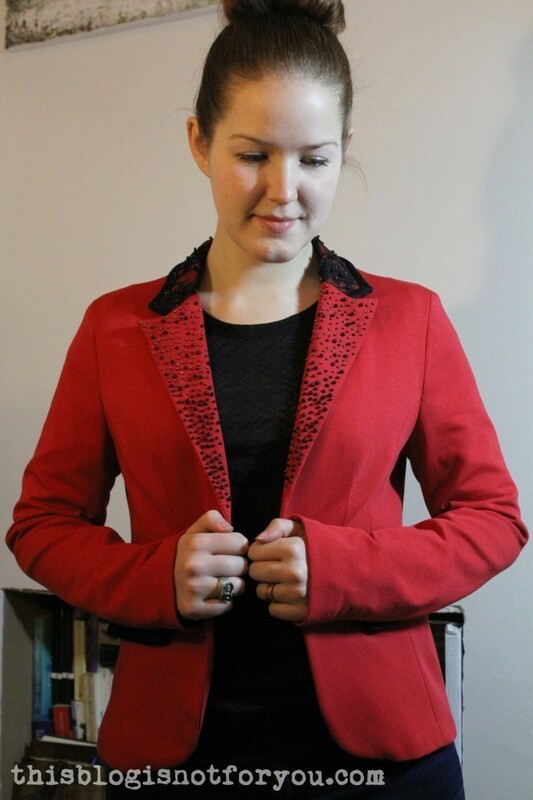 I love that it’s a jersey blazer, which kind of makes it more casual (since I don’t go to fancy events too often). But I thought that some contrasting colour was missing. It was just too red. Look at all the red. RED. 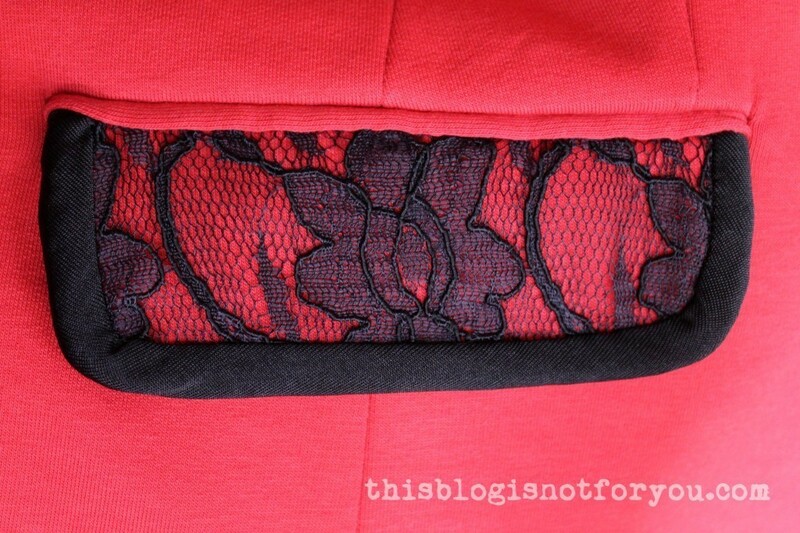 I love to combine red and black and found that beautiful black lace in my fabric stash that has been waiting its turn for quite some time. I also love to embroider fabrics with beads and sequins, I have no idea why. It takes so much time and hurts your eyes, but I guess the process is just really relaxing and meditative, like knitting for example. 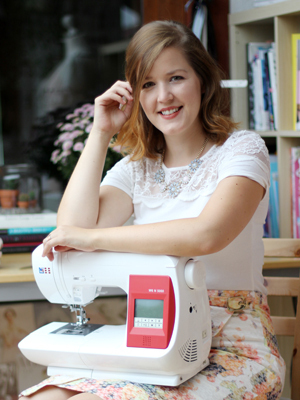 So if you don’t have access to a sewing machine, this could be a perfect project for you. You don’t need too many materials, no complicated sewing techniques, just a handful of beads, a few strips of lace and bias binding and A LOT of time and patience. 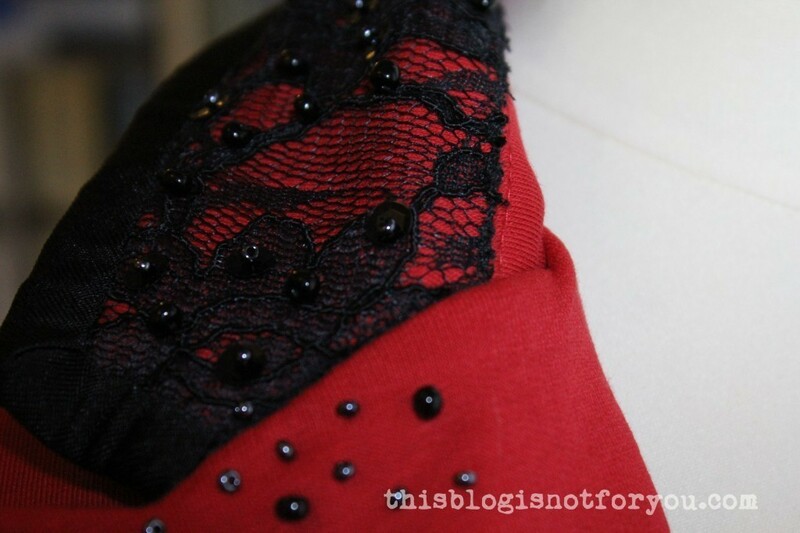 If you do not have so much time, omit the beads and use some lace trim instead for the collar. 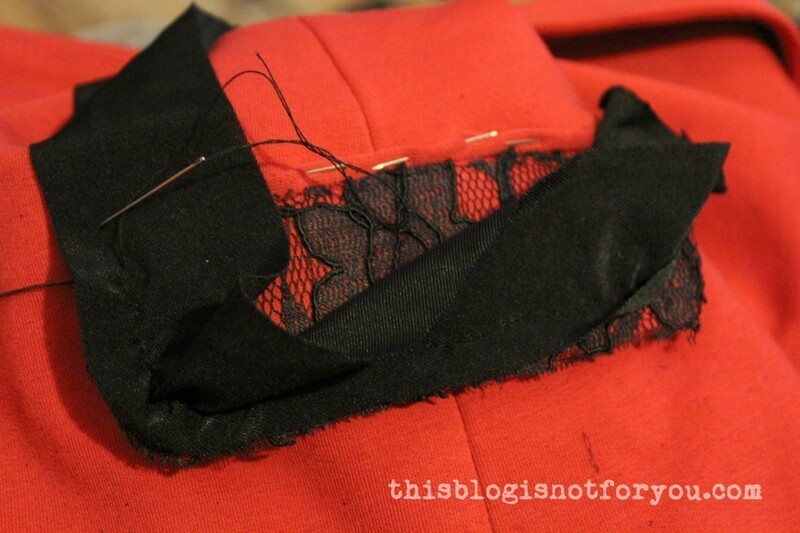 First of all, I took out these two bad guys (by opening the lining at the hem). I made the bias binding from a black jersey (I guess there’s some Lycra in it, too). 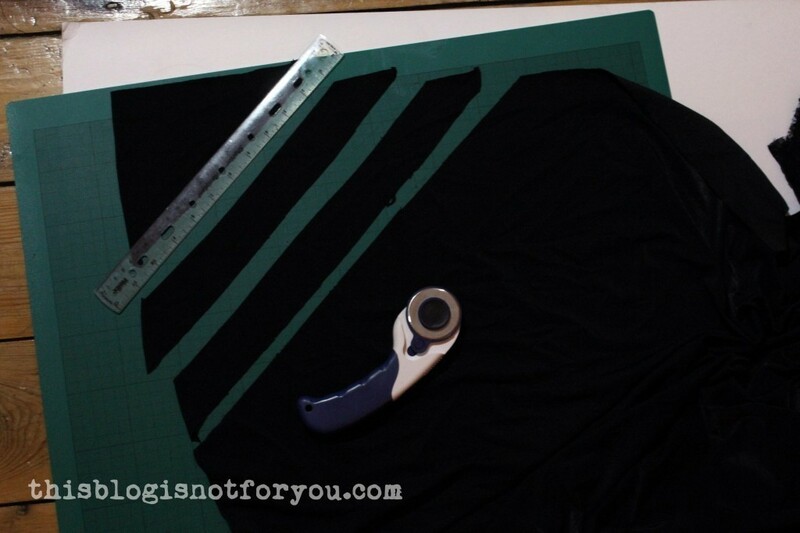 Cut out some strips of fabric (approx. 4cm wide) on the bias, enough to cover the edges of collar and pockets. 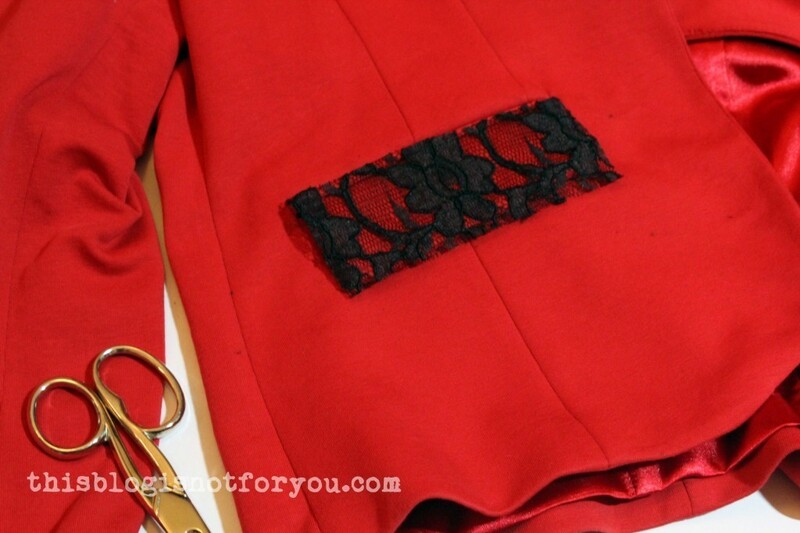 Cut out the lace, a little larger than the pocket. Pin it. 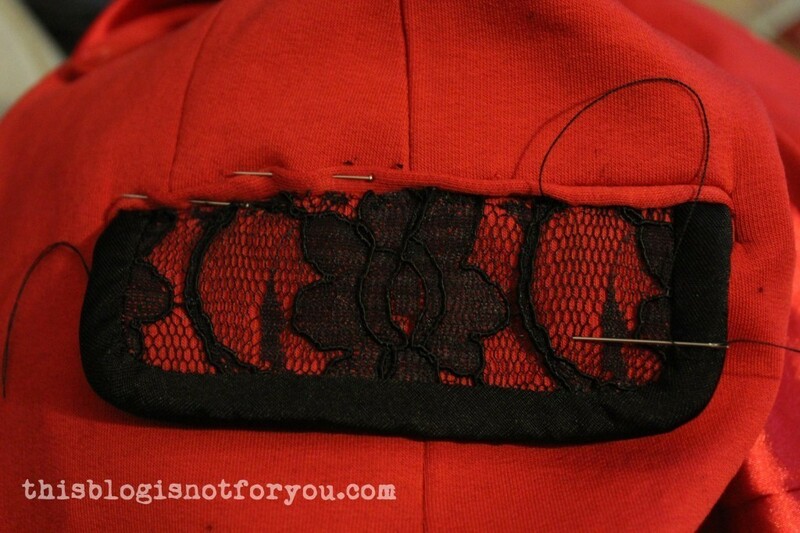 … then pin up the piping (if there’s some), so you can easily hide the lace under it. Start with the side facing up. 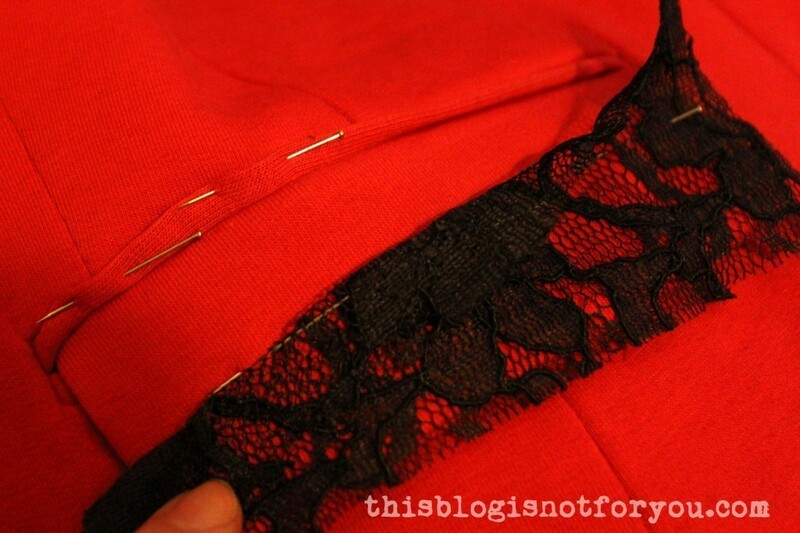 Place the bias binding on the lace, right sides together. 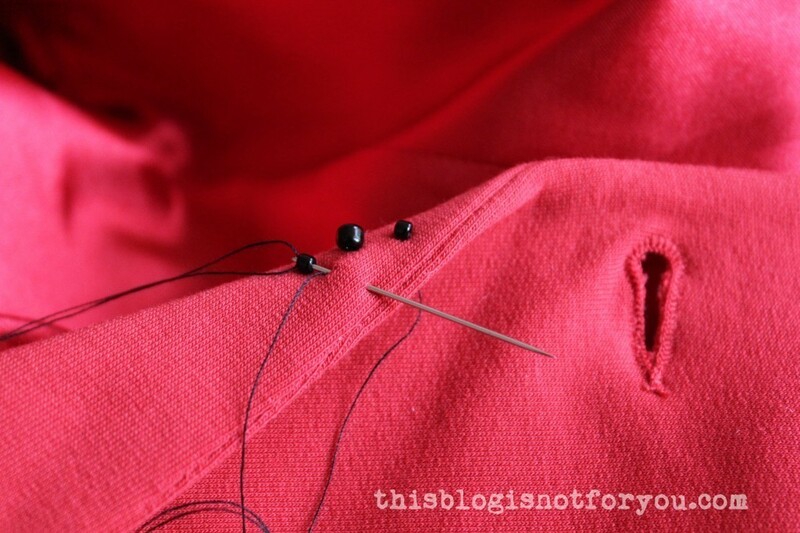 Handstitch approx. 1cm from the edge. Tightly pull the binding over the edge. Pin the raw edge under and stitch (I used a backstitch). 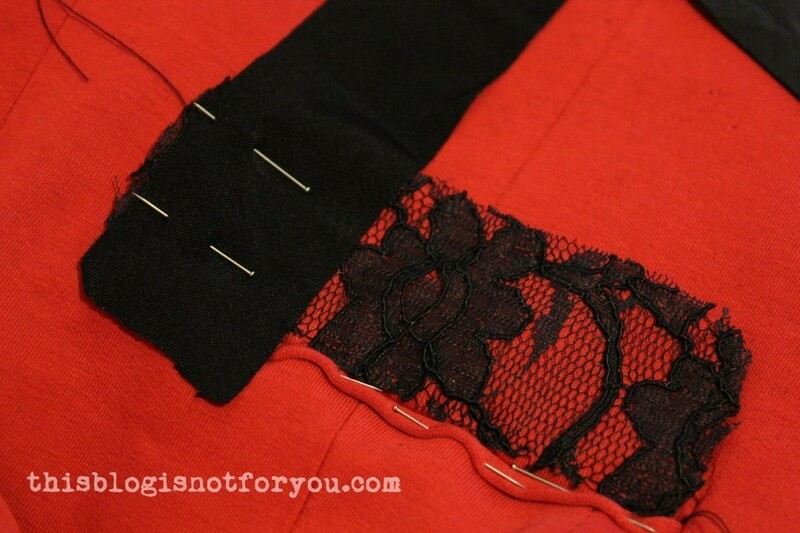 To hide the raw edge of the lace, I sewed the piping onto the flap using a slipstitch. Now it’s time to add some sparkle! 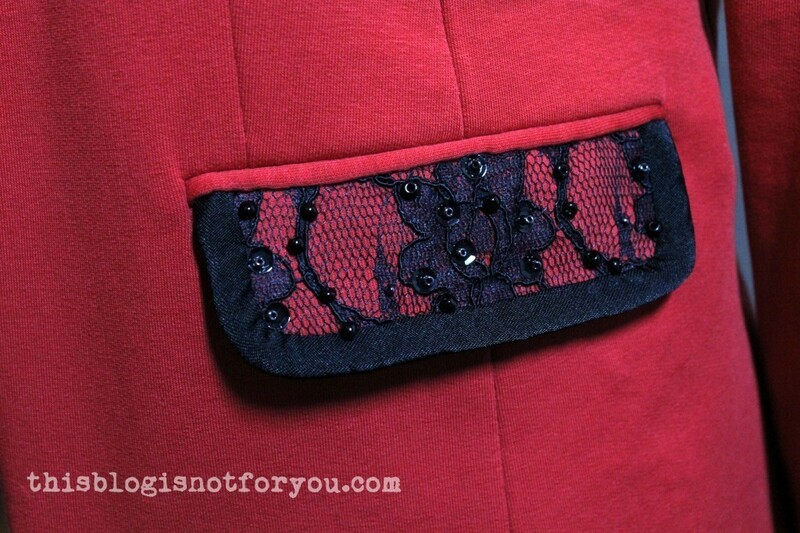 I embroidered the flap with black beads, silver-blue rocailles and black sequins. 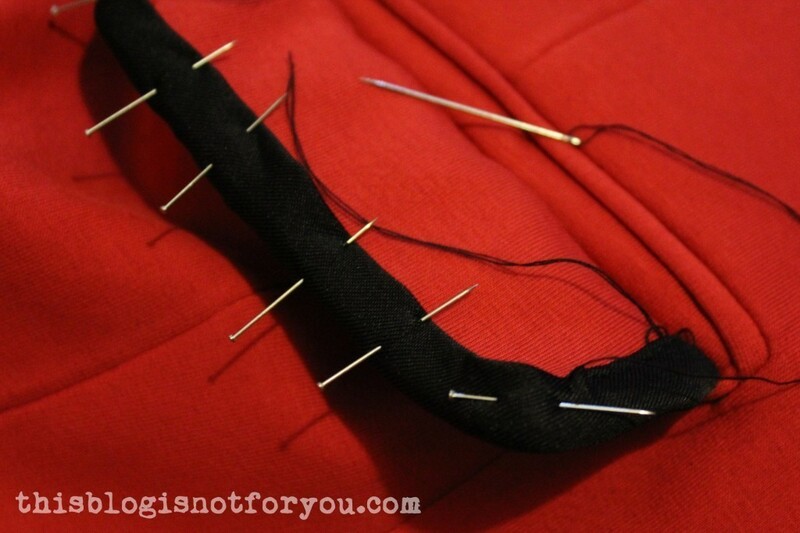 I embroidered the collar sewing on black beads in two different sizes, starting at the bottom. Half-way up the collar I added silver-blue rocailles. 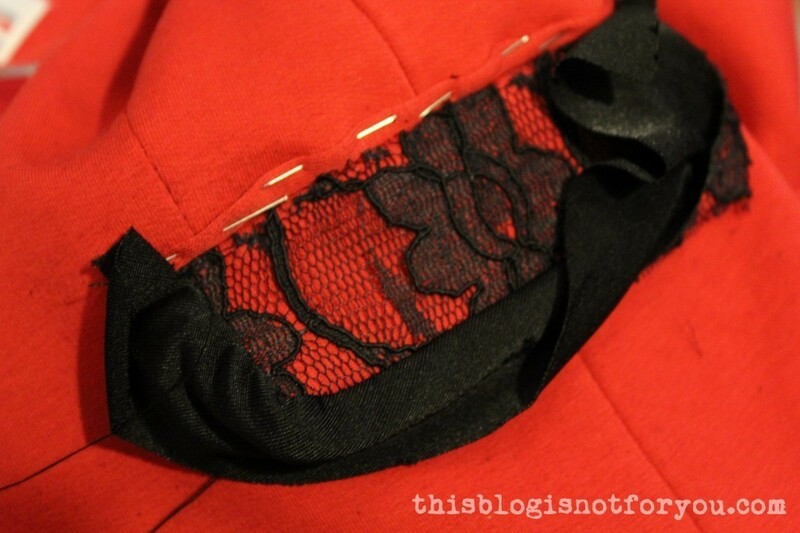 Since the collar did not have piping where I could hide the raw edge of the lace, I used a satin stitch all the way along the lower edge where I couldn’t add bias binding. This took almost as long as watching the whole Episode IV. So may the force be with you! 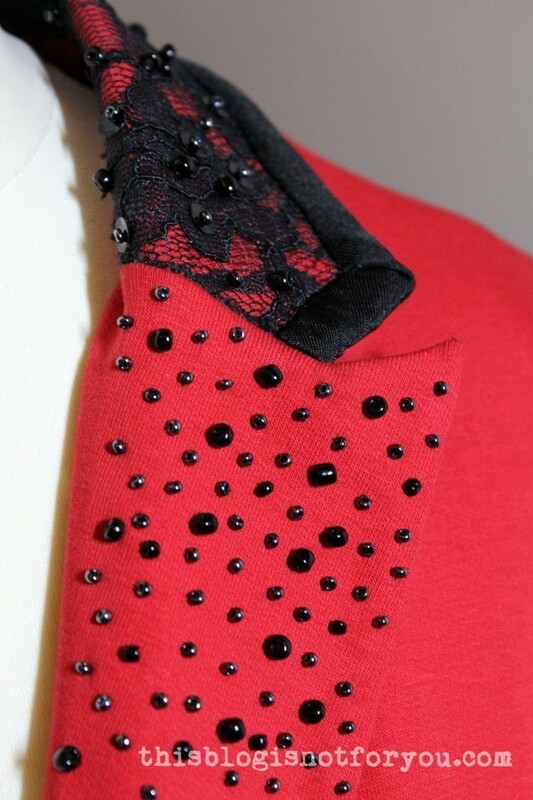 Here’s a close-up of the embroidered collar. I placed black sequins under the silver-blue rocailles. 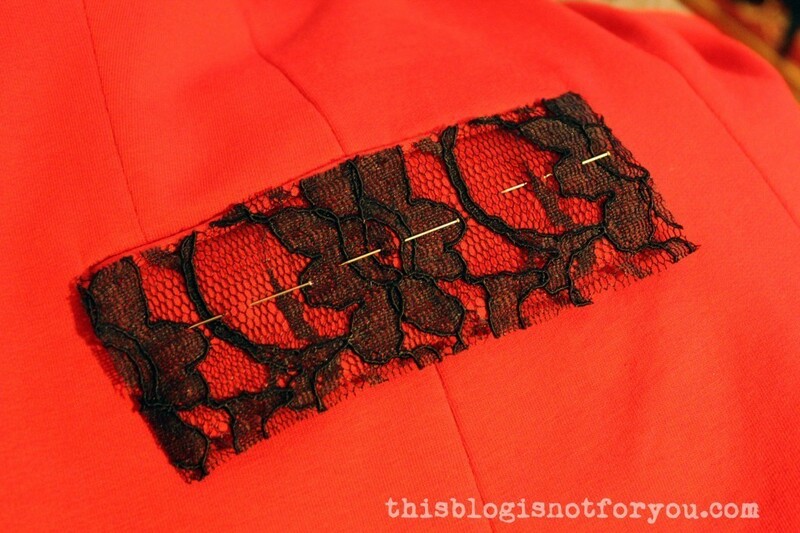 The beading also keeps the lace nicely in place. I love my old new blazer (thanks mum for clearing out your wardrobe 🙂 ). 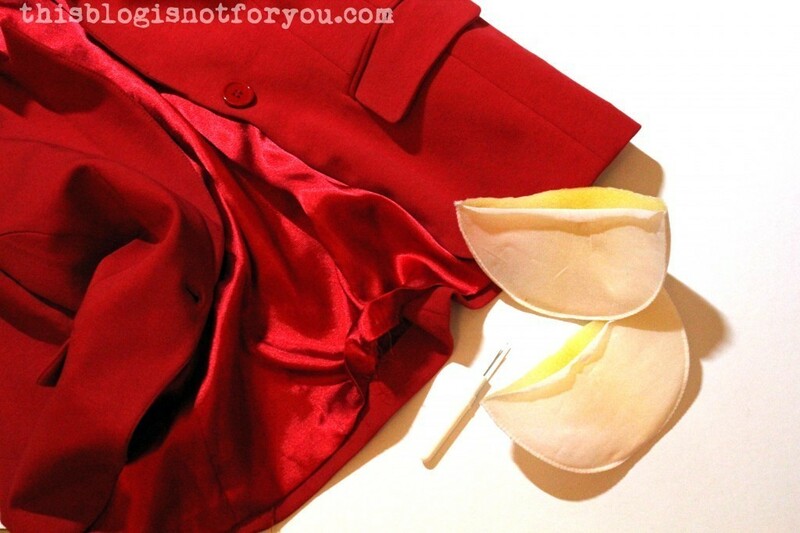 I don’t like so much that the blazer lost a bit of its casualness. It looks really good with jeans and t-shirt, but I still feel a bit overdressed wearing it at work or when having coffee with a friend. What do you think? How would you style it? 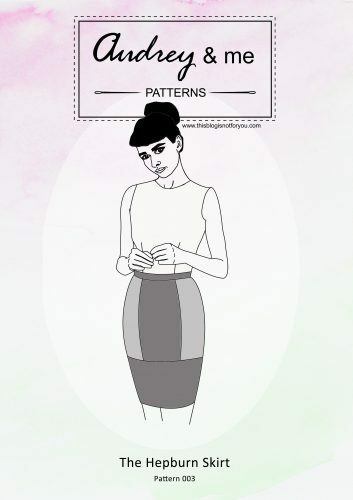 Do you also enjoy time-consuming sewing-techniques (haha)? I’m pretty sure I’m too lazy to ever attempt something this beautiful bu hand- but I LOVE it! I can see it dressed up or casual with jeans. You defined that jacket! Such a transformation! I’m not sure I would have the patience to stitch so much by hand but your results certainly make it tempting. In fact I have a cream jacket that could use a bit of a refresh. I hope you get lots of wear out o fit. Thanks for the inspiration! Thanks Claire. Yeah, it took ages, but it was worth it! Nicely done! It looks lovely. 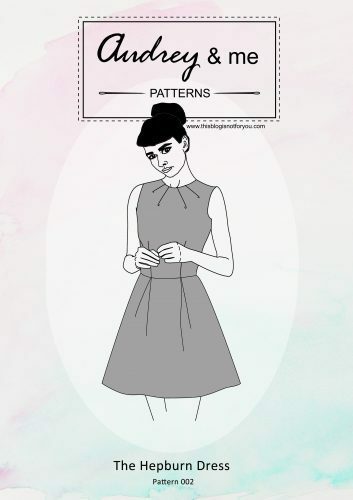 Don’t know where you work, but you could pair it with a nice pair of black pants and maybe a print tee to put a bit of less dressy look into it. Just a thought. That’s a fab idea! Will definitely try this! I love this. But I really wouldn’t be brave enough to attempt a project like that. 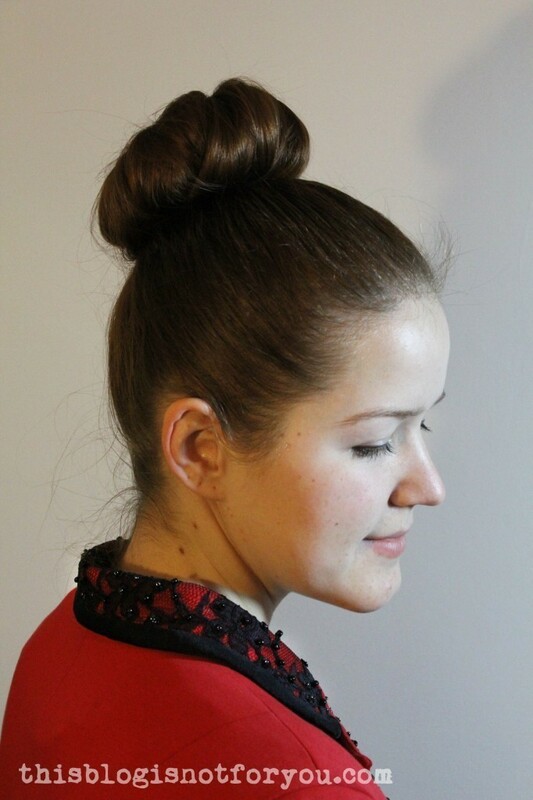 Enjoy wearing it- it looks amazing. WOW! I love this so much! 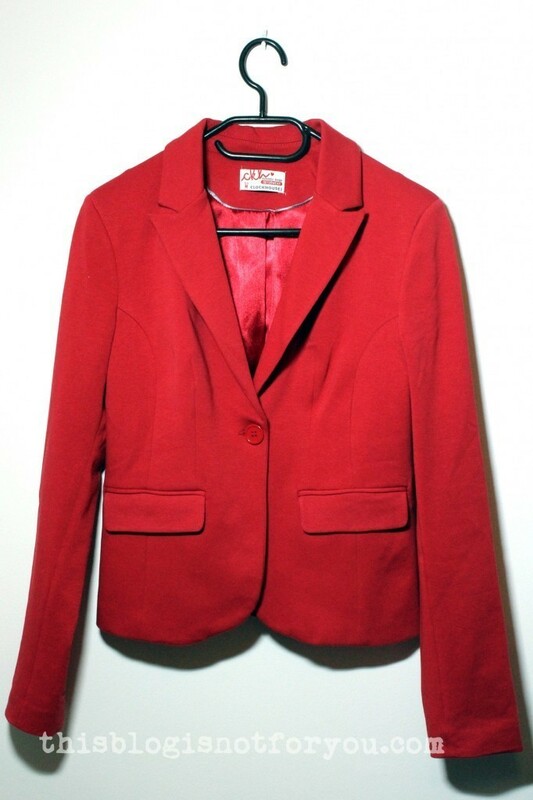 I need to go thrift shopping for a blazer now! What a lovely update – simple but makes a huge difference!